Tracerco, part of the FTSE 100 Johnson Matthey Plc, is inviting oil and gas companies to challenge the efficacy of their innovative OTC Spotlight on New Technology 2015 winning, Discovery™ Subsea CT Scanner. Customers are invited to attend to witness Discovery™’s amazing analysis capabilities in real time. They will learn about how Discovery™ uses computed tomography (CT) to provide a 360 degree, high resolution scan to reveal the nature of the abnormality. 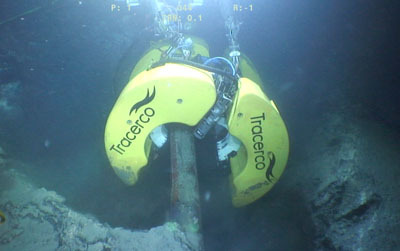 Lee Robins, Head of Subsea Services at Tracerco, said: “The success of the deployments of Discovery™ and the customer reaction has been phenomenal, which is why we are inviting other interested parties to our testing facilities to witness this ground breaking technology being tested underwater. The ground-breaking technology allows Tracerco’s experts to obtain an accurate measurement of pipeline conditions. Discovery™ can distinguish between hydrate and wax build-up and will also give data on weaknesses and wall thinning of flowlines. In pipe-in-pipe applications, it can also detect water ingress between pipes, allowing both the inner and outer pipeline in a pipe-in-pipe system to be inspected from the outside. For flow assurance issues it can also diagnose the effectiveness of any remedial treatment.